Stroganoff? It’s more like stroganON my face. That worked only in my head, didn’t it? Fiiiiirst of aaaaall, Parenthood. Who else calls complete wonk-a-lonk that next week is the LAST episode? I just read that this season was an “abbreviated” season with only 15 episodes. Well you know what, they can abbreviate my fist in their face. This isn’t the END end, is it? I can’t find a single thing online about when seasons 5 through 483 will start up again. This is not good for my blood pressure, you know. Secondly, uuuugh okay I’m not done with Parenthood just yet. Bev’s notes: Team Hank. Team Amber’s cute ombre hair. Team Ryan. Team Kristina. Team sticking the entire show in my imaginary womb. End notes. Alright, can I tell you how hard it is for me to spell portobello? 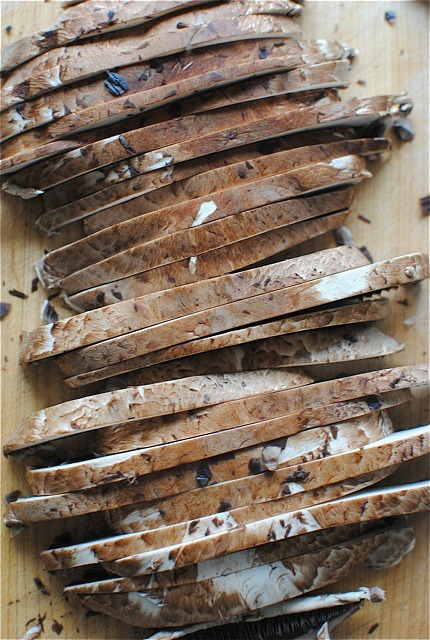 Portabella. Portobella. Porterbeller. Portabello. Portybelly. Portlskjfsslkdfjsfkd. That giant squiggly line underneath the correct spelling can talk to the hand. I sound like I have anger issues this morning. I swear I totally don’t! I’m as happy as a baby infant clam. But I’m also as nervous as a baby infant kitty cat. Wanna know why? We’re making a Bev Cooks video! It’s not going to be a cooking show video though. It’s a surprise! What I CAN tell you is that it will most likely feature my n’awesome top knot and my lame attempt at perfecting the Electric Slide. Ya think I’m kidding. I’ll be sure and ‘gram the train wreck next week. Ay yi yi. Mmmmmm look at this next photo. Even though this stroganon my face isn’t the most . . . photogenic meal I’ve ever put out into the interflex, once one single molecule of this comfort train reaches the surface of your lips, and you fall to the floor in utter submission, and then regain your strength for the next bite, you won’t care a smidge. 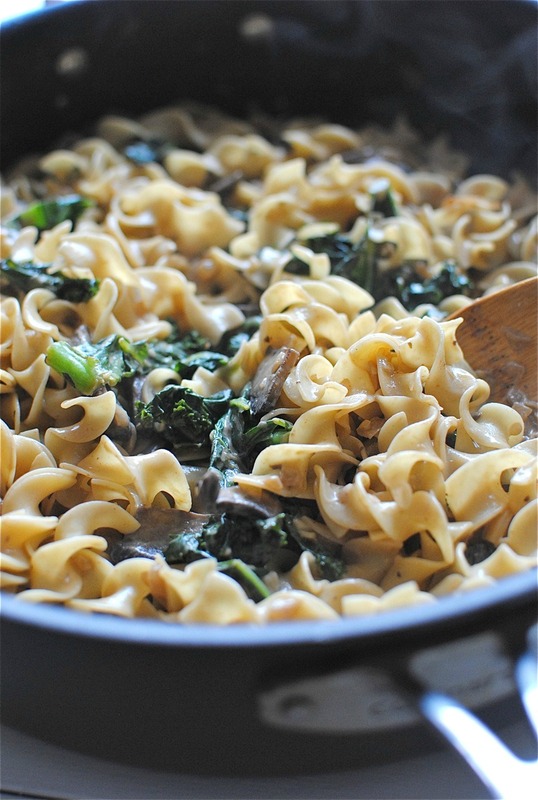 Hints of smoked paprika, earthy mushrooms, superhero kale, creamy noodles for days. This is basically the yummiest knuckle sandwich for your soul. Heat the oil in a large skillet over medium-high. Add the onions and sauté for about 4 minutes, or until they start to soften. Add the garlic and mushrooms; season with the smoked paprika and a pinch of salt and pepper. Sauté another 3 minutes, until the mushrooms have softened and are darker in color. Lightly dust the mushroom mixture with the flour and toss to combine. Add the stock and the tomato paste. Stir to sort of dissolve the paste. 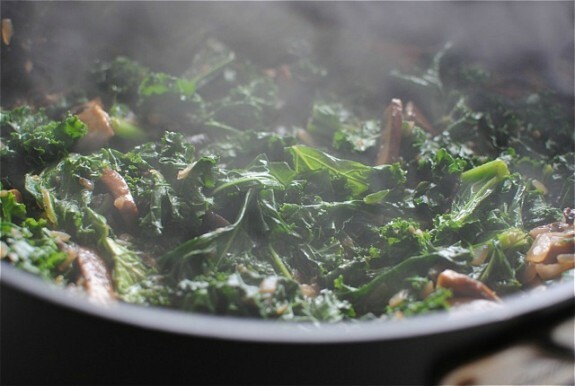 Add the kale and the bay leaf; simmer 5 to 10 minutes. In the meantime, cook the egg noodles in boiling water until it reaches al dente, maybe 5 minutes. 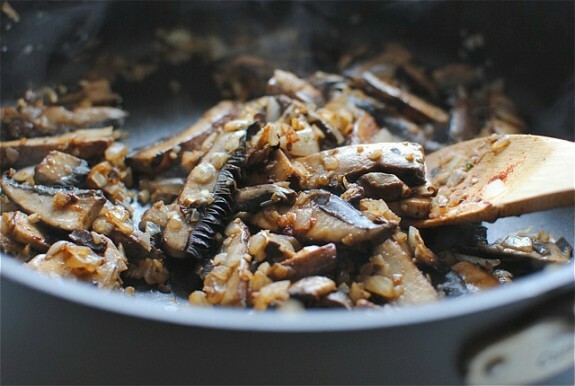 Drain and add to the mushroom skillet. Add the sour cream and stir to combine. Hmmmmm, creamy. Remove the bay leaf and dig on in, y’all. I think that the pictures are beautiful. You could not take a bad food photo, even if you tried really, really hard. This looks delicious!! My husband will love this recipe. I can't wait to give it a try. My mom used to make a beef stroganoff that we all adored. I like this healthier twist. I want this right now!!!!! My husband won't eat creamy foods. Long story but it makes me want to cry. Maybe I'll add the yogurt behind his back. Stroganoff is one of my favourite food words ever. It's just the most fun word to say (and to eat). Looks delicious. What meat could you add? You could always add seared chicken or beef! Anythang you dig. I love how meaty portobellos are. MMMMM Delicious! 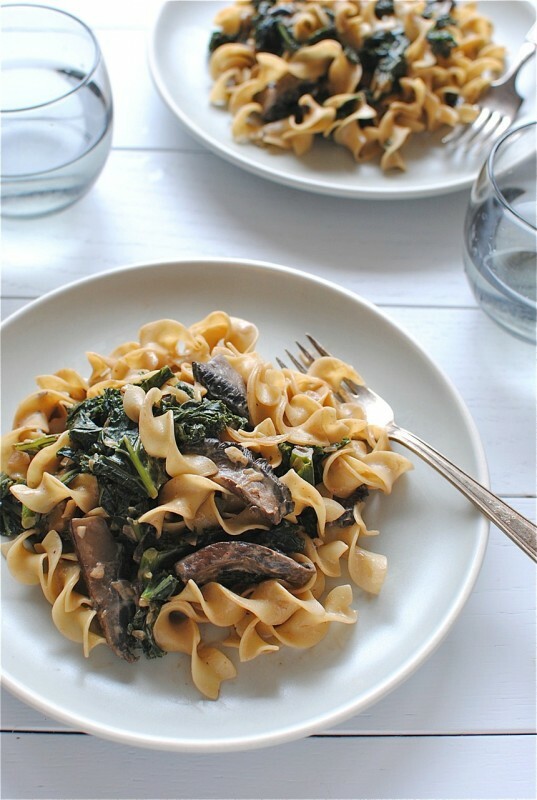 I love how you healthy(ed)-up stroganoff with mushrooms and kale. And I have to say that the pictures look great to me! oh I just can NOT wait for the video! I'll be sure to watch it at home since I can't bust out laughing at work. I'd be laughing WITH you, not at you. Ok? Kinda. I'm slightly lying. Ohmyflippin'gosh I have been fa-reaking out about Parenthood. So good. SO GOOD. I'm already having withdrawals. And this meal is going to make emotional eating so much better. Such a great variation on a classic dish! 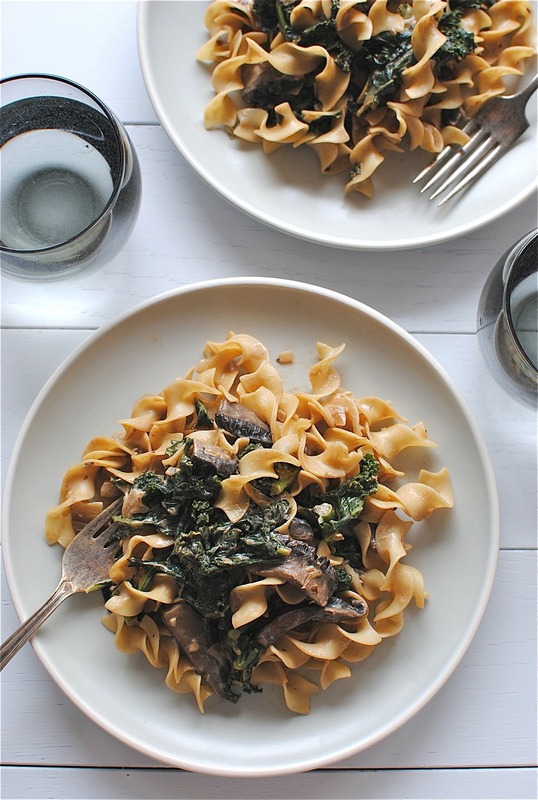 Love mushrooms, love kale, love stroganoff! Can't wait to give this version a go. I'm totally digging this healthier version of the "strog". Can't wait to see the video! You are going to rock sista! I can't wait to see what you come up with in this video. And this combination of flavors - out of this world! Fabulous way to incorporate portobellos with kale - wow! Great weeknight dinner. Dont even get me started on Parenthood! I'm too stressed out thinking about it. Looks like a plate full of looove! "StroganON your face" haha you're so funny Bev! Although I must admit I'm not a big fan of kale - except for those baked chips with more parmesan than kale- , your stroganoff looks SO GOOD I might change my mind about those greens! 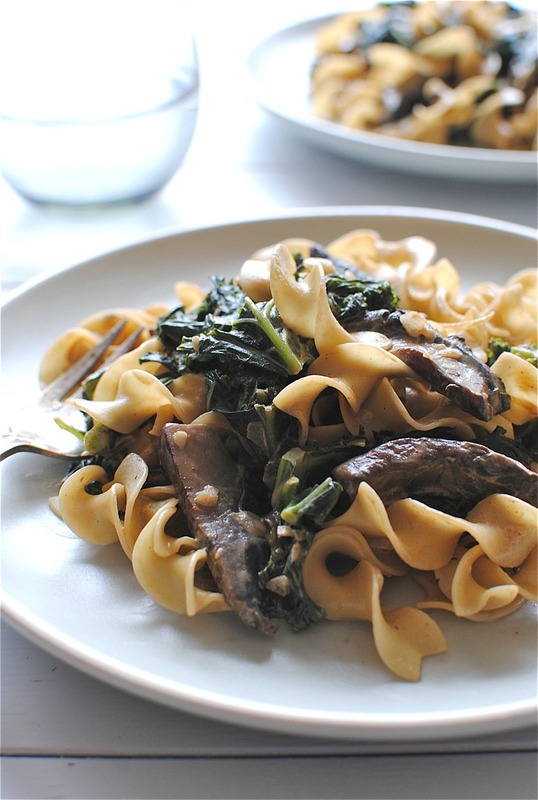 This looks like a delicious, hearty, healthy alternative to traditional beef stroganoff. I'll definitely have to try this! Very nice photos as well. Bevcooks MOVIES!? I cannot wait another single minute. This looks phenomenal! Soooo yummy. Such a good, healthier version of the classic! I'm going to try this tonight but instead of using sour creme or yogurt, I'm going to add hummus. Thanks for the recipe. 1. Stroganon my face is way cooler than you give it credit for. It should be part of the official recipe title, annnnnnd the name of every NHL defenseman who starts as a rookie this year. Add it to the new player agreement. 2. Portybelly made me giggle. Out loud. 3. You're always hilarious, but this might just be my favorite front-to-back post of yours yet. Wait, your post has a back? Go ahead and pat it, then. Beautious. Will try this one for sure. Thank you, ma'am. I made this last night and while it looked quite different from yours (oh dear!) it was definitely yum. Will have again. But the question is... what do I do with all this leftover kale? I bought a bunch at a farmer's market and they really give you a BUNCH. Meghann -- make kale chips! We always end up with lots of kale -- we buy it for our guinea pigs and also eat it ourselves but somehow always end up with more than we need. I just wash and dry, throw in a ziplock and toss with olive oil, garlic salt, and onion powder, then spread on a cookie sheet at 350 for about 20-25 minutes and YUM! Much healthier than other crispy snacks! Perfect idea! 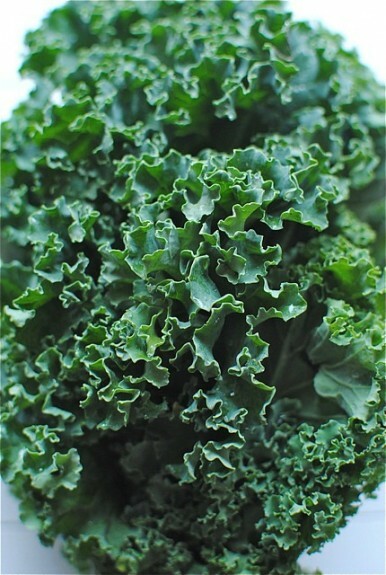 Now I want kale chips. Of course. This was awesome! And it was actually awesome BEFORE adding the sour cream, so that will become a variation for us! We are trying to become more plant-based in our household, and this was a perfect addition to our new meal rotations. My kids are 13 and 10 and even THEY didn't mind there was no meat in their stroganoff! Thanks for this fantastic and super easy and relatively inexpensive recipe! Definitely worth many, many repeats! Sooooo happy to hear this, Karen! Would you have any suggestions for a vegan replacement for the sour cream? Hmmm I'm not sure! Do they make a vegan sour cream? Or maybe the vegan mayo? Good question! I made this recipe tonight and it was delicious. I wasn't sure how the smoked paprika would play out (instead of my Stroganoff standard of Worcestershire sauce), but it was absolutely delicious. This is the first recipe of yours I have tried, but I will definitely be back. Thanks! definitely making this weekend! looks gorgeous...I wondered when I saw the Mom on previews to a new show if Parenthood was over. Great show with great conversation, it figures they would can it, but reality shows last forever...go figure. I made this for dinner tonight, and it was just lovely! Thanks for a keeper! Made this for dinner last night. *drool* Used baby spinach instead of kale because that's what we had in the house. Definitely a keeper! Thank you! This dish is amazing! I am always looking for ways to recreate vegetarian versions of some of my favorite dishes from my meat eating days. This dish hits the spot, I now make this on a weekly basis. Thank you for creating this! Totally satisfying! I had a few other ingredients on hand to use: Shitake and crimini, no portobellos, fresh herbed roasted turkey stock, curly spinach (in addition to kale) and white pepper.Use fat free greek yogurt or FF sour cream. Fresh thyme and a bit of turmeric, just cuz. I served it with a chilled pinot gris. Hoped for leftovers to brown bag and was disappointed as it vanished completely. Caught my friend licking his finger from what was left in the casserole before washing the cleaned pan. Made this... this recipe is gross! If you like smoked paprika flavor and slimy...this fish is for you. I know there are a ton of bloggers out there, but only leave a comment if you made the darn dish. Just made it! Soooooo good! Cant get enough!